With a range of brewing options and ease, The Keurig K575 is an automatic, programmable capsule coffee machine that features Keurig’s new 2.0 brew system that many users will come to love. Users can choose from a range of brewing options, from single serve 4oz K-Cups through to 30oz K-Carafes. In addition to the flexibility over brew sizes, the K575 benefits from some enhanced features and functionality from previous Keurig models, including a large 80oz water reservoir and 2.8-inch color touch screen. This model also benefits from 5 temperature options and strength control settings, with the ability to brew up to 12oz of plain hot water (for tea, etc.) if one day you prefer to drink another delicious beverage in the morning. It is important to note that the K575 is compatible only with Keurig 2.0 coffee capsules, not the old-style K-Cups. This particular model is also sold without a carafe. 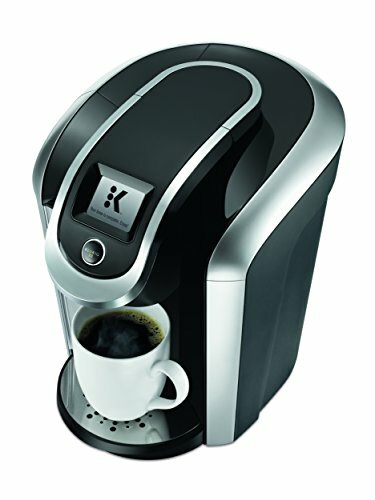 Looking for a Keurig K575 Alternative? Looking to Save on Keurigs? The K575 is sold new with a water filter handle, 2 water filters and starter variety pack comprising 6 K-Cup pods. The carafe is not sold with the machine (unlike some other models) but it is available separately. The K575 is compatible with the Keurig 2.0 My K-Cup reusable coffee filter (not supplied). Another day; another pod machine! Will we never tire of the convenience these great coffee makers bring into our lives as coffee drinkers? 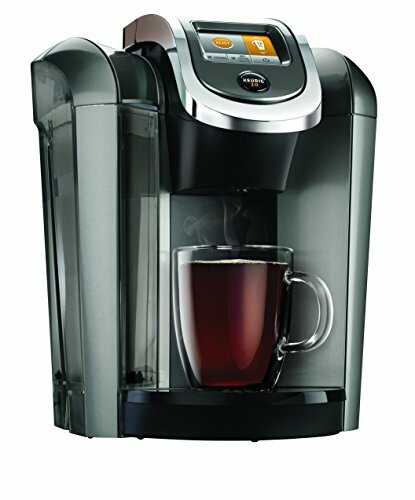 With the K575, we have, what the company calls, ‘The Ultimate Keurig Brewer’. Featuring the new 2.0 brew system, the K575 refines and, in some ways, enhances the pod experience even further. It includes an impressively large color touch screen (you can even choose background wallpaper! ), a larger 80oz water reservoir, and impressive brew functionality. This means that while you can enjoy a single cup, you can also brew a range of other size beverages, all the way up to the 30oz carafe. Note that a compatible carafe is not supplied with the machine and needs to be purchased separately. 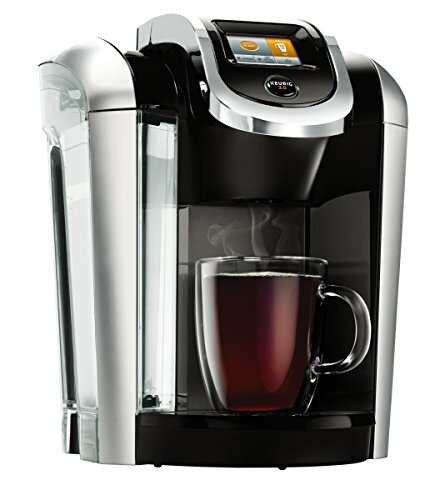 The K575 features a sensor to detect when a correct Keurig Carafe is in place. If you are new to the world of the pod coffee maker, you may not know that you can now buy coffee capsules that contain mug and carafe-size servings of delicious coffee. Simply insert the desired pod, ensure the water reservoir is topped up and brew multiple cups with the touch of a button, as easily as a single serving. The quality of the coffee produced by the K575 is fine if you like pod coffee. There is no milk steaming/frothing option built-in to the coffee brewer. If you prefer to have more control over the brewing process, the K575 offers the choice of 5 temperature settings, strength control, and also a separate setting for specialty beverages (such as hot cocoa, chai, and mocha) and great tasting. Other notable improvements Keurig has made with the K575 include a new 12oz single cup size serving and easier hot water dispensing, with the option now included in the screen menu, and the ability to choose a cup size for plain hot water (4, 6, 8, 10, or 12oz). Before purchasing, it is important to note that (officially) only K-Cups that are compatible with 2.0 brew system can be used with the K575. This may be a big deal to some potential purchasers, such as those with a huge stock of old-style K-Cups to use up or whose favorites are not available as a 2.0-compatible pod. However, there remains a wide choice of compatible pods available, so going with the 2.0 system does not limit the variety on offer, which is, of course, one of the great advantages of these capsule coffee makers. Of course, there are all kinds of tricks and cheats people have found to get around many of the restrictions manufacturers places on their pod coffee makers. However, we will leave it to you to search those out! Just be aware that by purchasing the K575, you are not opening up the entire world of K-Cups, as you might have expected. The outside of the machine should be wiped down with soapy water and a soft cloth; likewise, the water tank and drip tray (they are not dishwasher safe). Inside the coffee brewer the pod holder, housing, and base can be taken out and cleaned (again, with soapy water and a soft cloth). So far, so easy! You might also need to clean out the brewer’s entrance needle. A maintenance accessory is supplied which fits into the pod holder. Lifting and lowering the handle several times clears out any clogged grounds. You then need to perform a ‘cleansing brew’ to flush through some clean water. Additionally, the exit needle may need attention with the end of a paperclip, or similar, to remove any clogged up grounds. Every 1,000oz or 2 months the K575 will flag up a ‘replace water filter’ message, prompting you to purchase a new one. Descaling is required every 3 to 6 months. Again, a message will display when the coffee brewer needs attention. This process involves running Keurig Descaling Solution through the coffee brewer followed by a clean water rinse. Be aware that some third-party reviews have highlighted the fact the K575 requires more regular maintenance that might be expected, with clogged grounds a particular gripe. Start here with our top Keurig Alternatives resource. We compared the K575 to the K475 here. We also compared the K350 to the K250 here. The K575 is a good all-around pod coffee brewer that performs as advertised and there are some improvements on Keurig’s previous coffee makers models. If you like this style of delicious coffee you’ll likely be more than satisfied, even impressed, with what the K575 can produce and the extra functionality on offer. On the flip side, Keurig has made it pretty easy to be cynical about the K575. Pod compatibility aside, there is no longer an option to brew using your own grounds using reusable pods. There is also the small matter of having to buy your own carafe (maybe not a deal-breaker, just an unnecessary annoyance, and extra expense). If you’re a newcomer to this type of brewing, by all means, put the K575 on your list of potential purchases. It’s not the clear winner in the field, but it certainly warrants a close look. If you already have an older-model Keurig coffee brewer, ‘upgrading’ to the K575 requires some careful thought, as you may not be 100% happy with the direction Keurig has taken with the 2.0 brew system, especially if you have a stash of old-style K-Cups. Be sure to check out our latest Keurig deals tracker right here. At different times, different Keurig coffee makers models are on sale. Let’s see the main pros and cons of this Keurig k575 review. Pros: The K575 is a perfect versatile pod coffee maker from a leading manufacturer of this type of brewer. The 2.0 brewing system allows the user to make a variety of different brew sizes, from 4oz cups to a 30oz carafe, all at the touch of a button. Dispensing a required amount of hot water has been simplified. Additional functionality allows for temperature and strength control. The state-of-the-art design has a nice contemporary feel, including the large color touch display screen. The 80oz removable water tank is larger than previous Keurig models, including the K475. Cons: Pod compatibility is an issue, as are the restrictions on using ground coffee in a reusable capsule (unofficial ‘hacks’ notwithstanding). Third-party reviews also flag up some maintenance issues, including the need to unclog and descale the K575 more regularly than with some other coffee makers. In a sentence? The K575 is sold as the ultimate Keurig pod coffee brewer and it certainly offers an abundance of functionality, which adds to the convenience of this type of home brewing – however, the fact that the coffee brewer doesn’t accept all K-Cups (only those compatible with the 2.0 brewing system) does leave a rather bitter taste in the mouth that might not be a great tasting for every coffee drinkers. Gordon is seriously addicted to coffee. He also likes to write. Match made in heaven? Yes. After years of boring casual coffee drinkers to death with bean origin stories, he took to writing publicly here at 2Caffeinated. The new Keurigs do NOT have hot water on demand!!! In fact, they require an extra step compared to the older models. I do not press the “hot water” button. Why would you? You still have to lift the lid, remove the pod and press your selection button. Why not just do that like before? The whole “hot water on demand” is misleading and false advertisement.